Happy Friday! I’m blogging from Portland where I’m coming back from a three blogger summit with Tillamook. It’s been a fun (and tasty) trip and I’m looking forward to sharing the details! Before that, here’s a little post I’ve been wanting to post this week (and finally got to, now that I have two hours before my flight home). Did you know August is Eat Dessert First month? I’m not sure how this amazingly relevant piece of information has not been on my blog before. Well, I have Lychee Rose Macarons up already, and for this week I thought I’d really be seasonal and use some of the glorious fruit that’s out there. Blackberries are running riot right now, and the hubby is a big berry fan, so he asked if I could do something with berry-related. 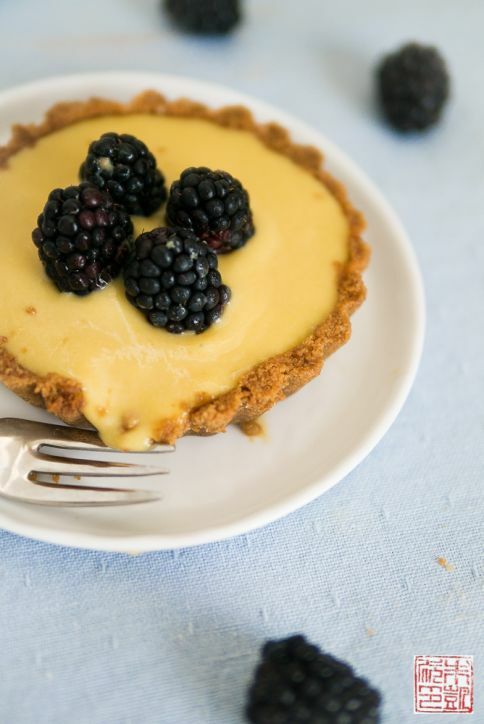 I wanted to pull together something quick, so I hit upon blackberries in a gingersnap cookie crust filled with mango curd. Sweet and tart and spicy – I think that hits most of hubby’s dessert criteria. I like making my own gingersnaps for this crust, but if you’re short on time (like I was this week), store bought works perfectly fine. If gingersnaps aren’t your thing, a graham cracker crust also works just as well. It’s no secret whenever I go to Asia I pretty much binge on mango, so I’m always on the lookout for good ripe mangoes here, which also happens around – now! I am lemon curd’s number one fan, but this mango version is a lush, tropical alternative. Although I’d use fresh mangoes if they’re in season, when I can’t find them or they don’t look so hot, I love mango puree as an alternative. I’m a big fan of Perfect Puree – you can find them in specialty stores like Whole Foods. The curd itself is a breezy one-bowl affair, and I always have to fight the urge to just eat it all straight. 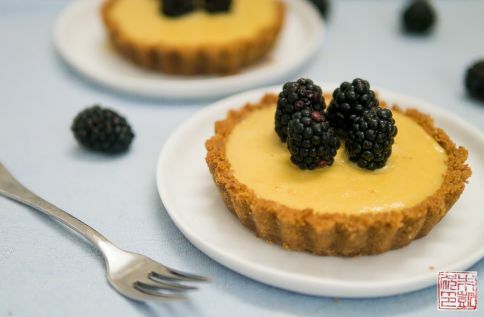 Sometimes I’ll fold in some whipped cream and serve it like a very soft mousse - you can also fill your tart shells with this if you prefer a more airy feel to your curd. What I like best about this recipe is that you can pull it together in a short amount of time. There’s no dough to roll out, super quick bake time, the curd come together in minutes, and you just have to wait for it to chill before filling and garnishing. I’ll have some more dessert up next week for Eat Dessert First month. In the meantime, enjoy your weekend, and eat some dessert! Combine mango, sugar, egg yolks, and lime juice in a medium heatproof bowl. Set over a saucepan of simmering water without letting the bottom of the bowl touch the water, and whisk until the mixture begins to thicken and the temperature is about 170 degrees F. Remove from heat. Add in the butter pieces a few at a time and whisk to incorporate. Scrape curd into a container, press a piece of plastic wrap to the top, and chill in refrigerator for a couple hours. 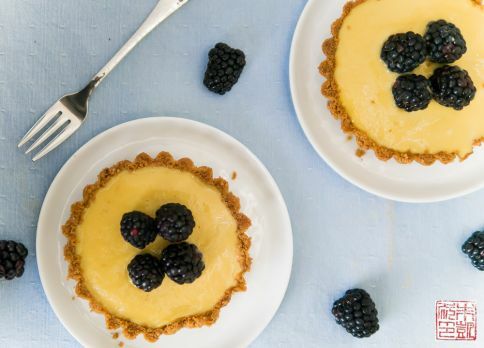 Fill tart shells with chilled curd. Top with blackberries and serve. Mmm loving that mango curd! Yum!